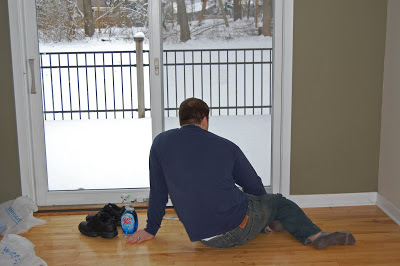 As I mentioned before, we spent Valentine’s Day cleaning our new house. It took all day Saturday and a good part of the day Sunday. And let me just say this: it is NO fun cleaning 3 bathrooms, let alone cleaning 3 bathrooms worth of dirt and grime that was not created by you….gross. Oh, and there was dog hair everywhere! Jeez, I don’t know how the previous owners could stand it. But, after all of our hard work the house is finally clean! My husband cleaning away…any ideas of how can I get him to keep doing this once we move in? My mother-in-law, Connie, and sister-in-law, Erin. I have the best family in the entire world, don’t you think? Our expert cleaner, my father-in-law, Jon. 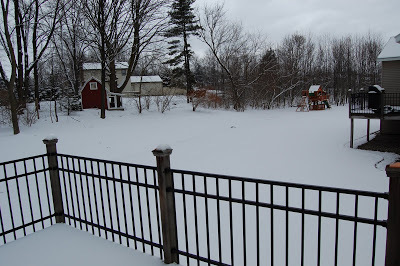 My mom wanted to see the back yard. So of course the day I go to take pictures of it is the day we get snow dumped on us. 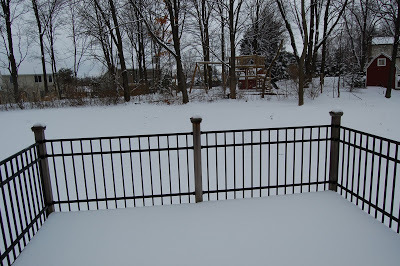 This is the deck…obviously. View to the right. Isn’t it weird how no one has a fence? I think it is so strange. In California everyone has a fence! 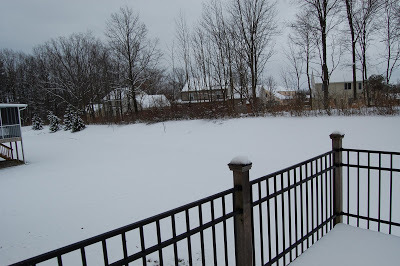 About 80% of the houses we looked at didn’t have fences….it must be a weird Michigan thing. I’m so glad you have so many great helpers. I really wish I could be there to see everything in person…..thanks for the pictures! So very cool sweetie….spacious and cute too. The paint look great to me as is…….wish ours looked as good! So when is mom flying out…….BEV?